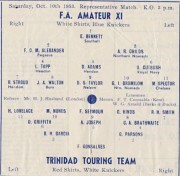 BATTLE BETWEEN BRITISH GUIANA, BARBADOS AND TRINIDAD FOR MARTINEZ SHIELD. "Official intimation was received yesterday that the Intercolonial Football Tournament between British Guiana, Barbados and Trinidad for the Martinez will start on October 23. The British Guiana Football Association requested the postponement fromthe original date--Oct. 17, until October 23. Both Barbados and Trinidad have acquiesced to the request. The British Guiana team will arrive in this colony in the Canadian National Steamship Lady Drake on October 21. The Barbados team is expected to arrive on the same day. All matches in this competition will be played in the Queen's Park Oval as well as the remaining football fixtures for the 1934 season. Trinidad has not yet started official practice games to select the team to represent the colony. It is stated that the match for the Gilbert Skinner Cup on October 7 will be the first official test.